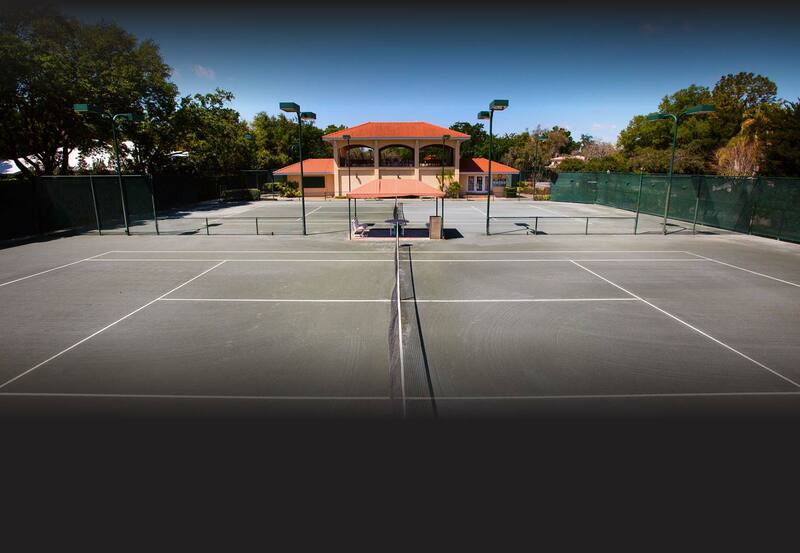 Avila provides tennis enthusiasts all they need to take their game to the next level. The fully equipped Pro Shop carries many exceptional brands such as Babolat, Wilson, K-Swiss, Lacoste and Oakley. Avila’s Professional Tennis Staff is always available to help in fitting tennis goods and offers same day stringing for racquets. Customer orders can often be accommodated. Private and group lessons are available with Avila’s USPTA certified coaching professionals. A favorite class of members is the cardio tennis clinic that provides fitness and tennis instruction in an exciting social atmosphere. For members looking to get in some practice on their own schedule, a Playmate ball machine as well as hitting wall are available. In one-year, good restringing maintenance should be compared to the amount of weekly play days. If you play three times a week, you should restring your racquet every four months. The looser the strings, the more power you will have; the tighter the strings, the more control you will have. Our pro shop offers a variety of strings to suit your needs and we also provide same day stringing. Our brands include Wilson, Babolat, Solinco, and Luxilon. NATURAL GUT: The ultimate tennis strings. NXT: Playability and comfort. Closest feel to natural gut. STAMINA: Long lasting synthetic gut for the more powerful player. RPM BLAST: More bite, more spin. HYBRID: Combination of strings to achieve individual player’s needs. Our Playmate ball machine is a great partner for every level of player. Variations are easy to set up: cross-court, down the line, random, topspin, slice, speed and combination shots. A child under 12 years old must be accompanied by an adult. K-Swiss, Wilson, Lacoste, Tail and Luck in Love. Replacement grip, over grip, wristband, headband, armband, string vibration dampener, socks, hats, bags, and tennis balls. We carry an assortment of Wilson and Babolat racquets for every player. Test drive the latest Wilson and Babolat demo racquets. Note: We can order from any brand. Visit our Pro Shop to demo racquets, to place a special order, or to simply discuss your needs. Racquet purchases made at Avila will receive complimentary first strings and complimentary labor (a $19.99 value). We carry K-Swiss, Babolat, and Orthaheel shoes. K-Swiss Bigshot: Propulsion plate technology keeps player on their toes during play. 20% closer to the court without sacrificing cushioning. Superfoam cushioning. Guideglide stability. Six-month outsole wear warranty! The fastest shoe on the market! Try Orthaheel for your heel, back, knee, and leg pain and for plantar fasciitis. Avila Tennis Center is an authorized Oakley and Maxx Sunglasses Dealer. The perfect eyewear protection for all sports. Special custom ordering is available. Stop by the Tennis Shop and check out our new selection of Oakley sunglasses!